Conventional SPARQL endpoints serialize query results into a range of formats, which are immediately sent back to the requesting user agent. Using SPARQL-Protocol URLs to share result sets is powerful, but this is not always feasible, especially because some data access tools are written to only load data from files. Virtuoso addresses the obvious need for file-based access to SPARQL query result sets via its built-in "dynamic WebDAV resource generator," a feature that leverages the Virtuoso server's native support of the WebDAV protocol. 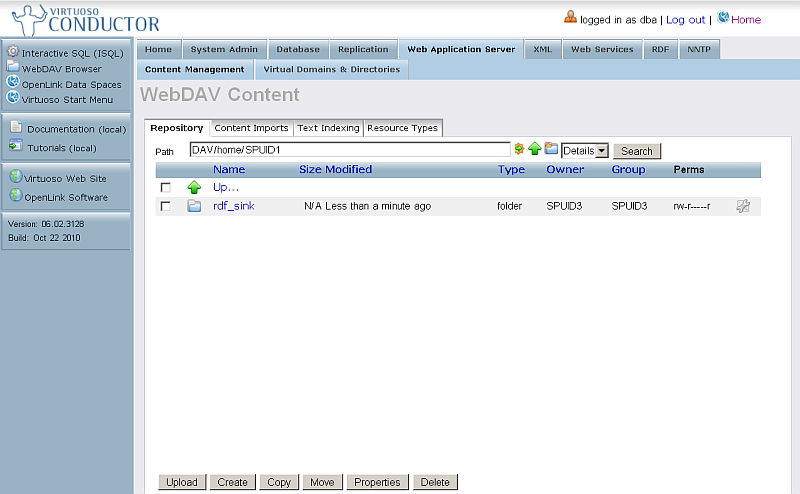 Through this feature, it is possible to connect any WebDAV client, which include most desktop operating systems (Windows, Mac OS X, Linux) and many other applications (e.g., Excel), directly to a SPARQL query result set as though it were opening up a local file. 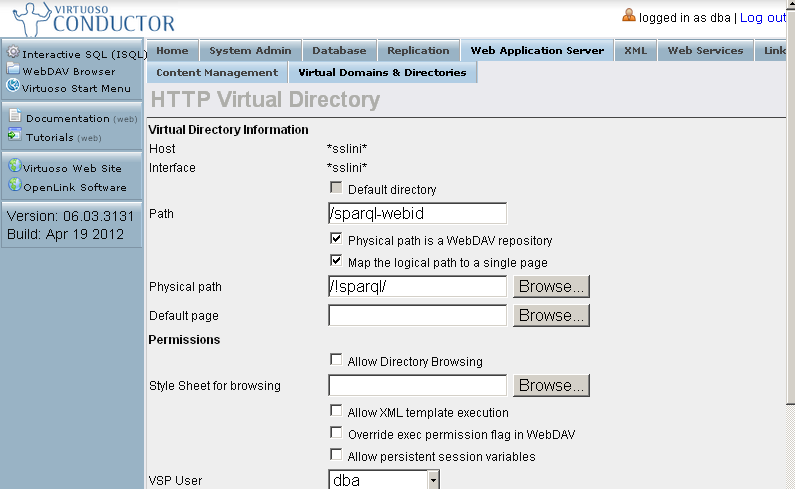 The steps below show how to set up a Virtuoso instance to permit saving query results from its SPARQL endpoint into its built-in WebDAV repository. 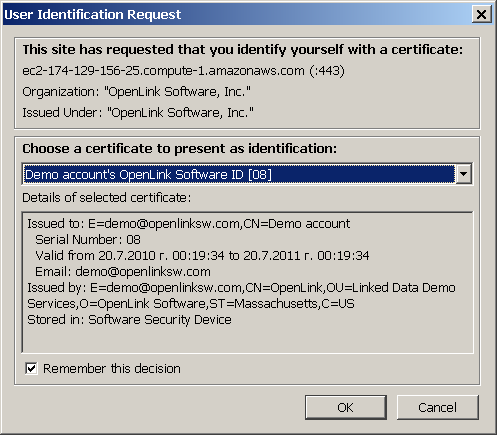 Make sure the steps from the Secure SPARQL Endpoint Guide using WebID Protocol are performed. As result should be created new account "SPUIDN", where N is 1, 2, etc. 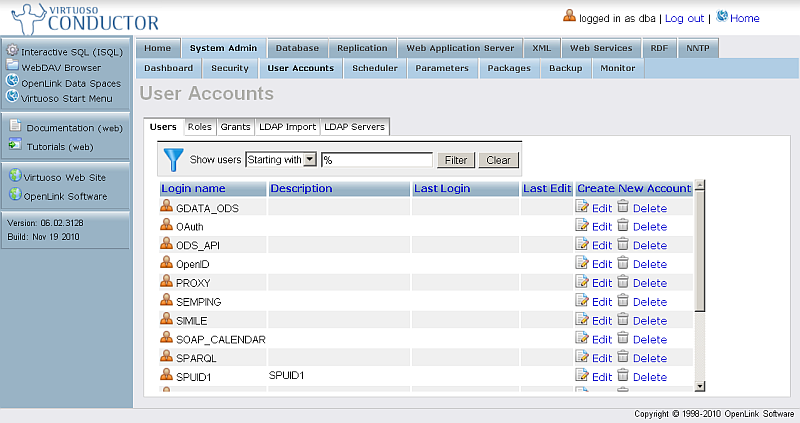 Note: for the purposes of this guide, we will use SPUID1 name for the SQL user account under which runs the Web Service endpoint. For the SQL User from above click the "Edit" link from the very right column. 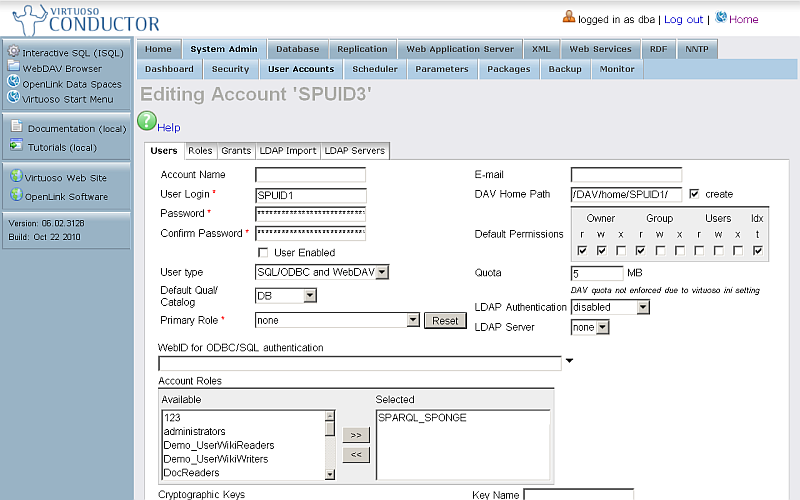 Set "DAV Home Path" to "/DAV/home/SPUID1/"
The home directory should contain a subdirectory named "saved-sparql-results"
Note: the subdirectory should be of "DynaRes?" for DAV Extension Type. Locate the sparql-webid virtual folder. If not found, click "New directory"
Hatch "Physical path is a WebDAV repository"
Hatch "Map the logical path to a single page"
Go to the SPARQL+WebID? endpoint, https://<cname>:<port>/sparql-webid, where <cname>:<port> are replaced by your local server values.